This 45-year-old female has been a patient for three years. For three years, we had been using non-surgical treatments to address some of her aging concerns. She was using the Obagi Nu-Derm skin care system for her skin. 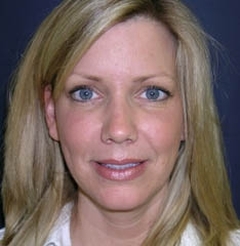 She had undergone microdermabrasion, BOTOX Cosmetic treatments to the periorbital area, and fillers in the nasolabial fold and cheek areas. She was looking to have more permanent and better improvement to the forehead, eye, and cheek areas. 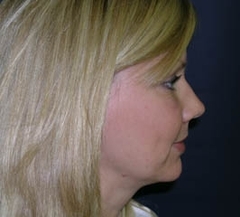 I suggested that we perform cosmetic surgery procedures including an endoscopic browlift to raise the brows, along with a mid-facelift and fat grafting to the cheeks. 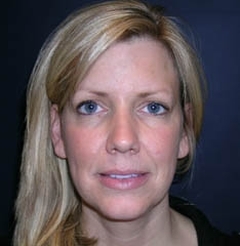 She underwent endoscopic browlift, mid-facelift, and fat grafting. The incisions for the browlift were placed all within the hair. Endotine fixation devices were placed beneath the skin to help get longer, stable fixation. 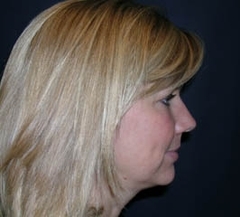 Fat was harvested from her stomach and used to help reshape the cheek areas. Her scalp incisions healed beautifully. There was no hair loss. 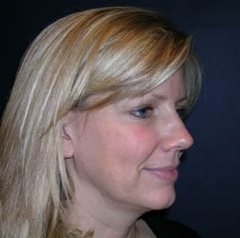 The "after" pictures were taken seven weeks following her facial cosmetic surgery in St. Louis. She is thrilled with her result. Her sister, who was not aware that she underwent surgery, told her she looked ten years younger. The patient then told her sister she had a haircut.